You're probably not very conscious of it, but deep in the back of your mind, hidden behind the memories of last year's christmas dinner, lurk a few killjoy brain cells dedicated to worrying about flat tyres. You check your tyres each morning before you head off, and maybe you'll top them up. 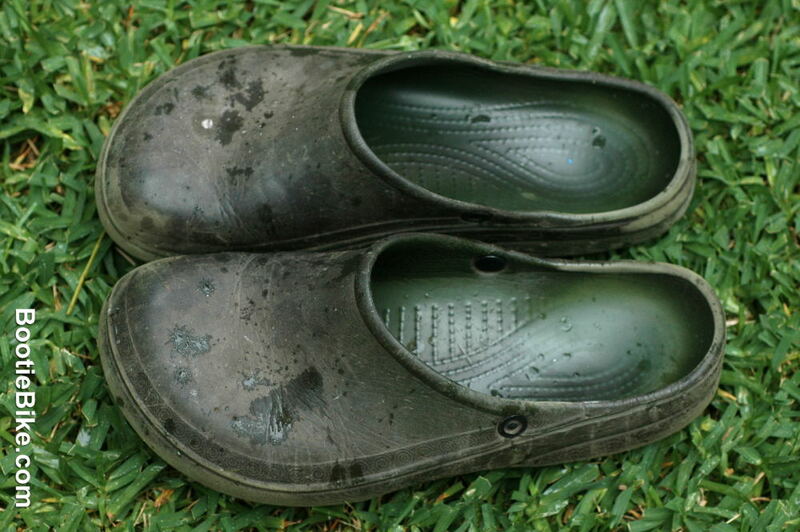 And you have a quick look at them before going home, hoping they still have air in them. You keep your eyes peeled for broken glass or nails or sharp debris as you ride, and, when stopped, you pick the broken glass or nails or sharp debris from the tread before it works its way through. These and others are all life distractions we take for granted, the price we pay for the performance, handling, grip and comfort of our chosen pneumatics, even when we don't get a flat tyre. Well, for many of us it could be time to put those brain cells to some other use. I know I could use them. Now could be the time to change because there is at least one decent alternative available. The maker, Tannus, calls them 'airless', but you might call them 'solid'. The truth is they're neither, as they're made of a high-tech polymer compound containing countless tiny air cells. The compound, which Tannus calls 'Aither1.1', feels a lot like a firmer version of what you'd find in sports shoes, or even those rubbery gardening clogs . 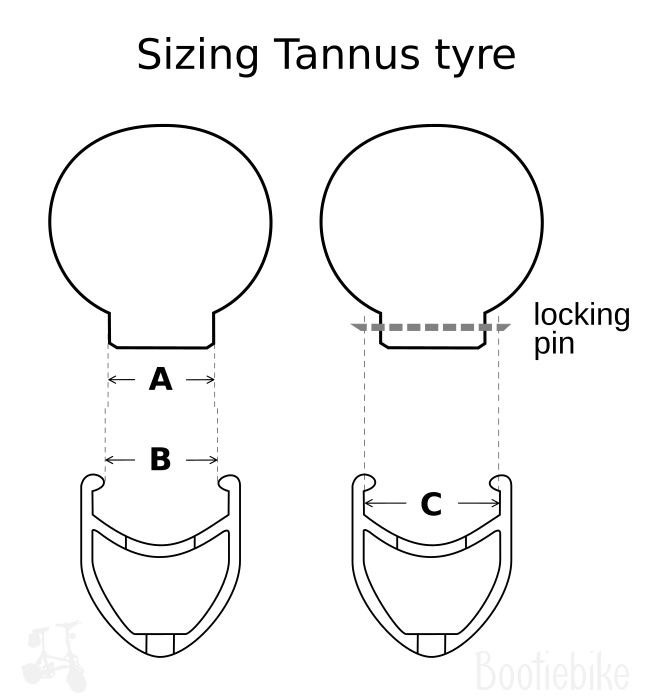 Tannus makes several varieties of bicycle tyres, but it's their 'road bike' tyres that are reviewed on this page, in sizes 700x23 and 700x28 (they also come in 700x25, x32 and x40). When reading my impressions on this page, keep in mind that they only relate to the two sizes named here. I cannot comment on any other sizes. 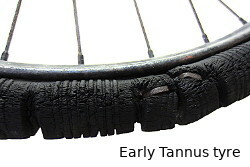 Tannus and other companies have been trying to introduce solid bicycle tyres to the marketplace, but they have never achieved wide consumer acceptance (but bicycle sharing systems certainly appreciate them). It seems that lingering doubts about the inherent shortcomings of traditional solid tyres are hard to overcome. One issue is high rolling resistance, which makes a bike less 'efficient', meaning that less of the rider's pedal effort is translated into forward motion. 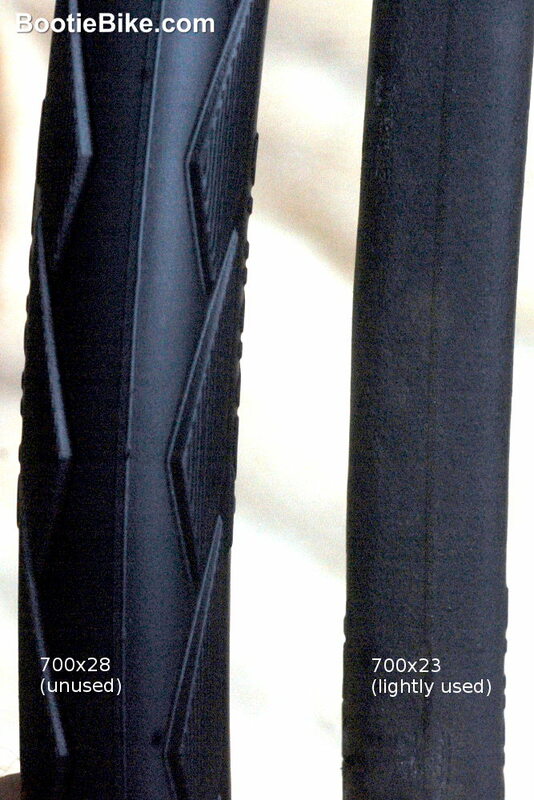 This is something that Korean company Tannus has been trying to minimise, and they claim that the rolling resistance of their latest tyres iscomparable to that of the best 'city' tyres (presumably that means tyres used on utilitarian bikes rather than road bikes). I'm happy to say that after sampling a few of their tyres I have no reason to doubt them. 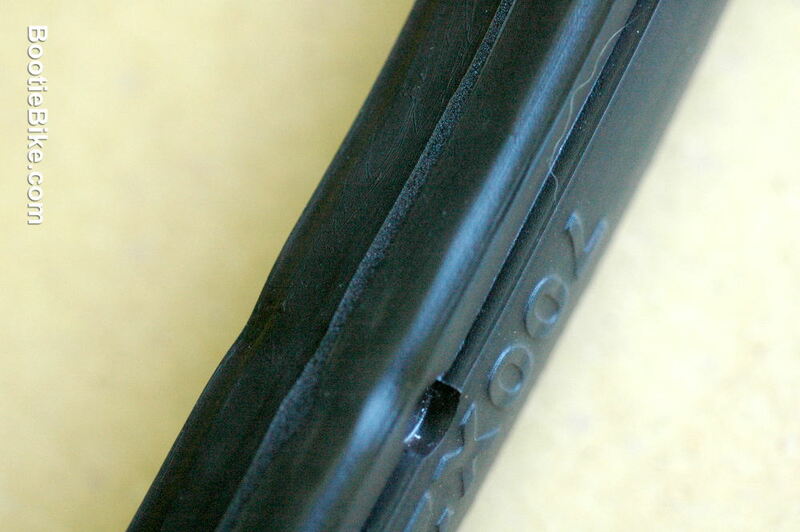 Solid tyres have also been criticised for being heavy and having a hard ride. The tyres tested here feel fairly light, so as far as I'm concerned their weight is not an issue. If there's a slight weight penalty, then I'm not fussed (considering the potential benefits), and in any case I'll be forever spared the burden of a spare tube (or any tube for that matter). The ride? Well, the two sizes tested here differed markedly in that respect; the narrower one is unacceptably harsh, the other is quite ok. 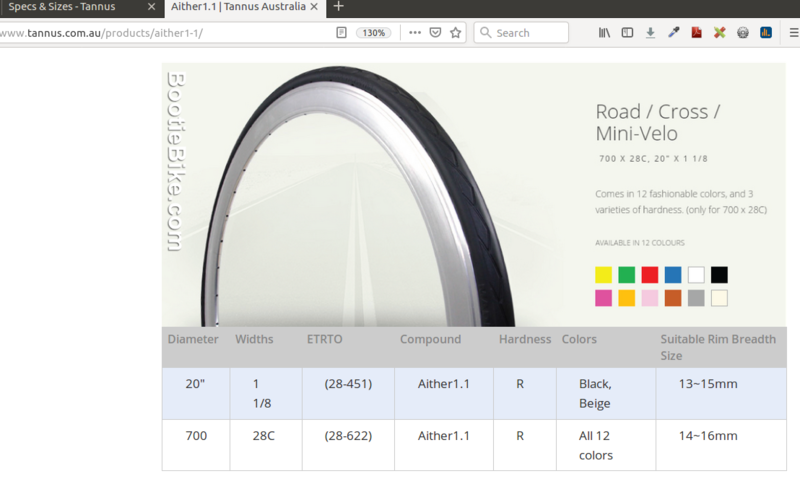 They are quite pricey, at almost $85 apiece (in Australia), but they are claimed to last much longer than conventional road tyres (at least 9000km). They'll probably save you the cost of a few tubes along the way too. And what price do you put on being able to ride without ever getting a flat tyre? If they work, it looks like a bargain to me! As far as riding goes, your opinion of these tyres will of course depend on your terms of reference, in other words, the tyres you're used to. In my case I'm used to a Schwalbe Durano Plus at the front and a Giant P-SLR1 at the rear, both 700x23, and run at 90–100psi. If you are familiar with this sort of thing, you will see that maximum speed is not my absolute priority, but I've been perfectly content with those tyres as far as their performance is concerned. 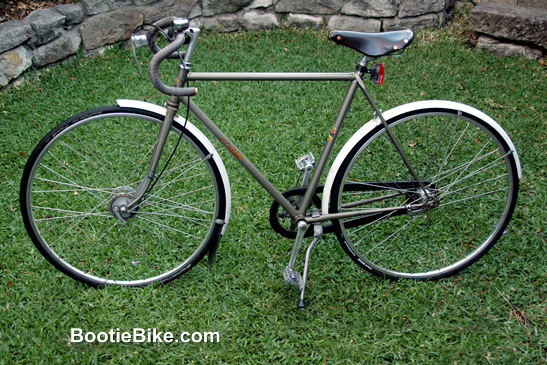 The bike – not a modern road bike – is built and used for fastish commuting in the inner city streets and busy roads in Sydney. I consider it a vehicle, not a recreation machine, so I'm aiming for car-like dependability. The road surface it's used on is occasionally smooth but much more likely to be cracked and potholed, and often sprinkled with broken glass and debris in less-trafficked areas. Motor vehicles don't get a flat every time they run over some glass, why can't the same be said for bikes? So what else was I looking for with these tyres? Most importantly, I wanted grip at least as good as the conventional tyres I was hoping they'd replace. I was willing to accept, and expected, a slight 'slowness' penalty, but not so much as to make the bike significantly less enjoyable to ride. And a bearable ride, if not quite as good, without any strange handling quirks, and no other disadvantages of any great significance. If they exceed any of those requirements, then that's a bonus. That's the lens through which I've looked at these tyres, but I'm keenly aware that others will have their own priorities. You'll notice I haven't measured average speeds or used any other form of objective measurement – I've judged it all on purely how it feels to ride, as I think that's all that really matters for non-competitive riding. The test consisted of riding around for a week or two, as I normally would, with each new combination. At no time did I notice any difference in grip or cornering. Perhaps slightly harsher ride, but overall not much difference to baseline setup – good enough for me! Considering the benefits, the Tannus 700x28 Aither1.1 is easily good enough for all but competitive use. The 700x23 rolls better but gives an unacceptably harsh ride. 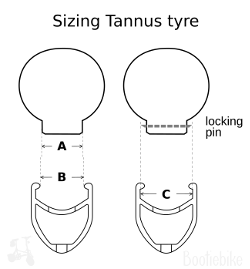 I've included some information here about sizing Tannus tyres as it may save you some trouble. If you're interested in purchasing these tyres, I suggest you read this section carefully. 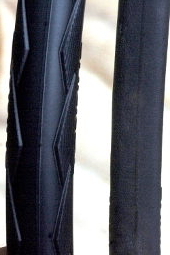 In cross section, the tyres could be compared to a squat light bulb. The bottom part of the bulb, or 'base' of the tyre, fits inside the rim. The base has lateral holes spaced evenly around its circumference. 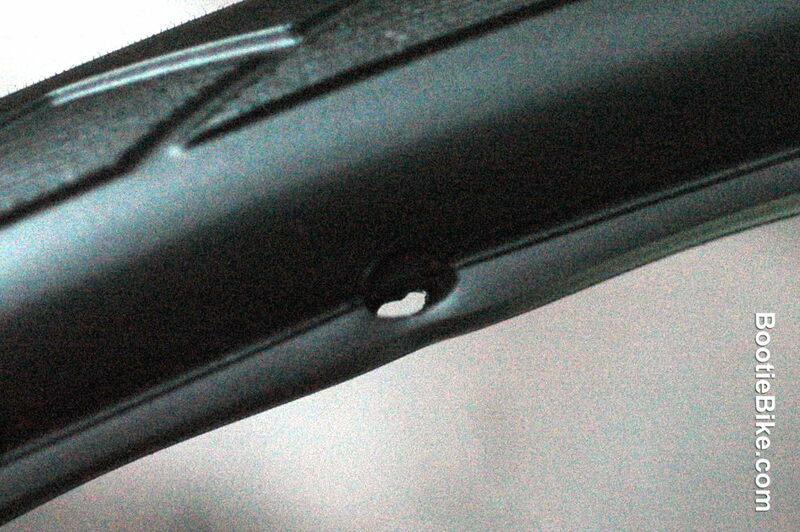 These holes accommodate the locking pins, which fit across the inside of the rim to hold the tyre in place. The locking pins can't come out because their ends are under the hooks of the rim. 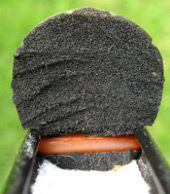 The width of the base ('A' in the picture) must suit the 'rim breadth', i.e. 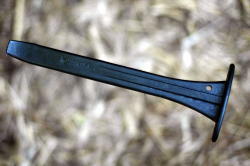 the width of the rim between the hooks ('B'). The instructions supplied with the tyres say that 'A' and 'B' should be the same size, or 'a little tight'. As for the locking pins, they should be a little wider than the internal width of the rim below the hooks ('C') – the instructions say dimension 'C' plus 3-4mm. 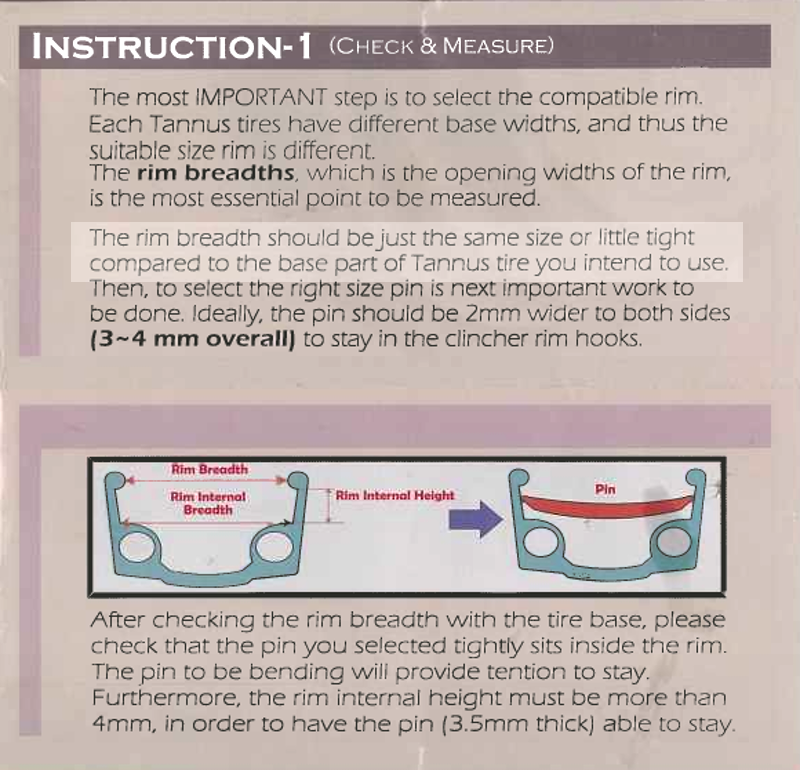 Meanwhile, the information on the Tannus website (Aus) provides a range of rim breadths for each size tyre. For example, it says that the rim breadth should be 14-16mm for the 700x28 size – which has a base width of 18mm. There is not much you can do if the base of the tyre does not fit in your wheel rim, other than replacing the rim. You should therefore, before purchasing, measure your rims (dimension 'B') and find out the width of the base of the tyres (dimension 'A'). 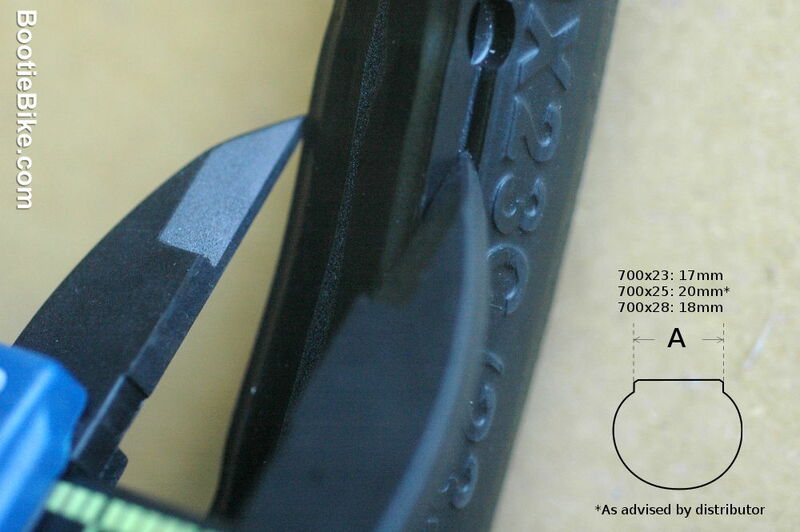 Bootiebike can tell you that dimension 'A' for the 700x23 size is 17mm, and for 700x28 it's 18mm. The distributor advised that the value for the 700x25 size is 20mm. I found fitting these tyres fairly straightforward but time consuming and fiddly. I think those who normally change their own tyres should have nothing to fear, but there's no rushing it. 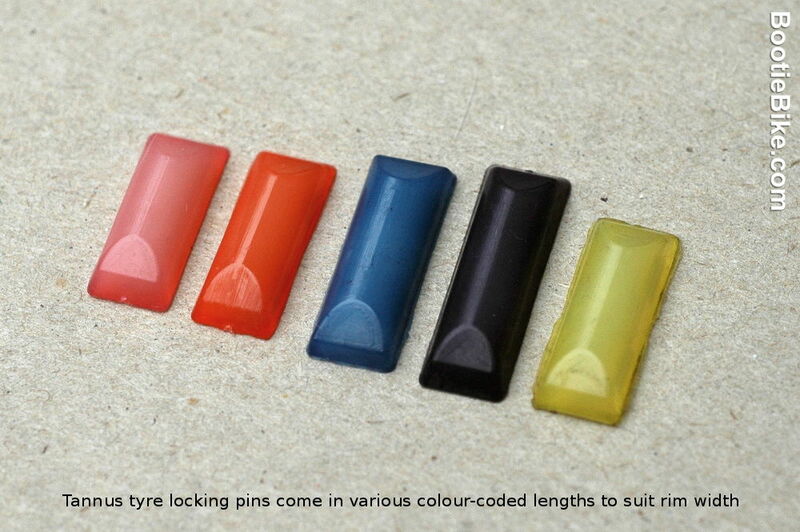 These 700-size tyres have 40 locking pins, and they all have to be positioned in their holes in the tyre and then carefully clicked in place in the rim. The pins are clicked into place with a special tool that is supplied with each tyre (more elaborate tools are available for the trade). The last tyre fitting I did took me over an hour, and I'd done it twice before. At least you won't be doing it very often, and certainly not at the side of the road. 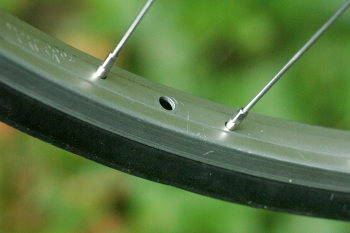 Insert the locking pins in the holes around the tyre, tapered side down. Adjust them so they protrude equally on each side. This simple step can take the best part of half an hour. Put the tyre on the rim. With the wheel on the floor leaning against you, put the tyre in the top of the rim and work it down both sides at the same time. When you get near the bottom, push it over into the rim however you can i.e. without worrying if it is on straight or not. 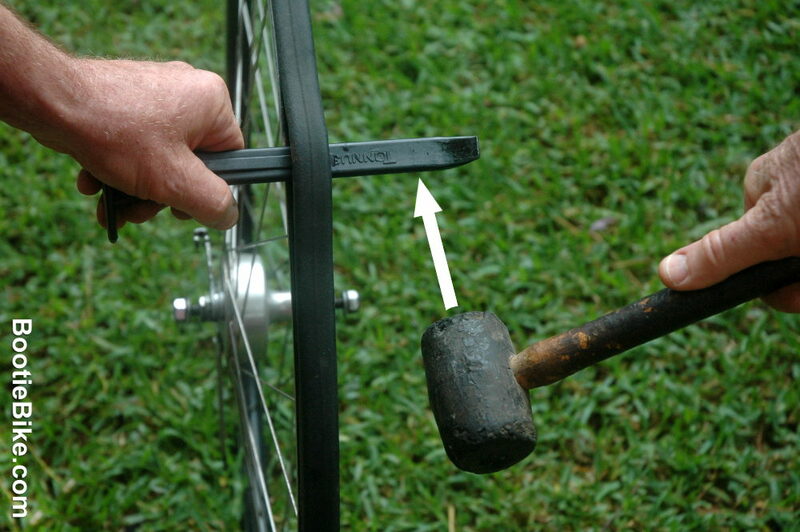 With the tyre fully on, straighten up that last bit by wrestling it with your multigrip pliers . Go over the whole tyre to make sure it is on fairly straight. 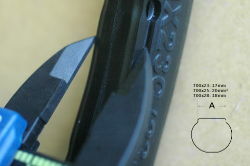 Using the special tool, make sure all the locking pins on one side are positioned under the hook of the rim. That should be easy. Now go around the other side, clicking them in. This is more about technique than brute strength – as it is more readily achieved by employing a pivotting motion rather than just pushing them straight down. You'll be glad to know that by the time you're finished you'll have it down pat! Check all the pins are clicked in place; with your multigrip pliers, go over the circumference, pulling the tyre to one side at short intervals to expose any miscreants. Now do the other side. When finished, use your multigrips to ensure the tyre is on straight. If it ain't, you'll be treated to a nice scary wobble on fast descents. After you've ridden the bike a few times, do a quick check to confirm all is ok. 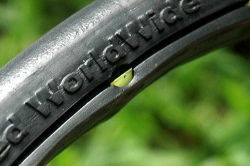 There is no need to worry too much, as the tyre will be held on quite securely even if a clip or two is out of place. 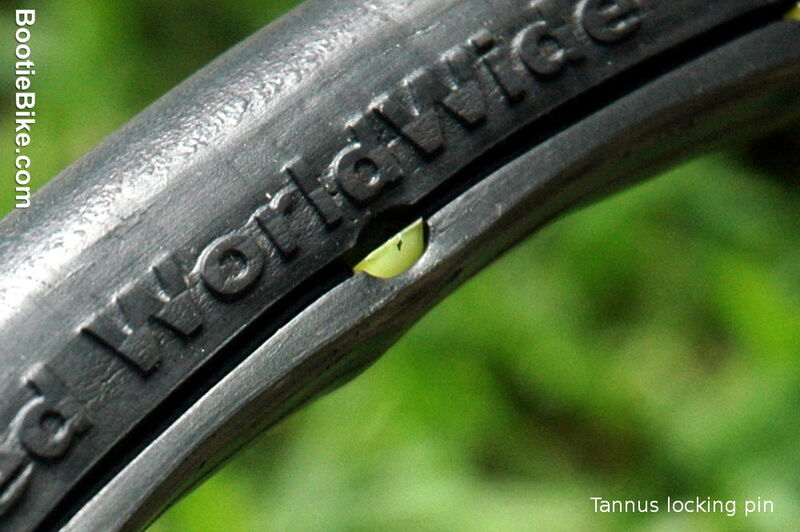 Dismounting a Tannus tyre is mostly easy, and there is no need to damage the tyre. Allow ten minutes. 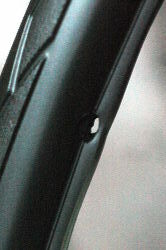 Insert the special tool between rim and tyre, midway between locking pins. 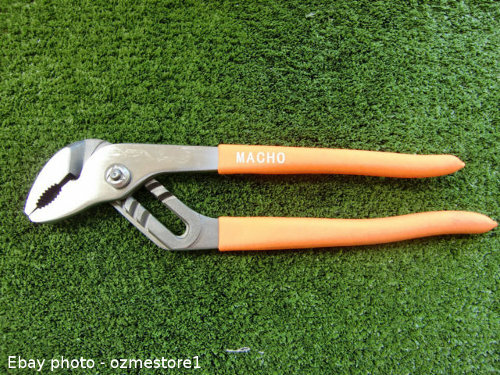 It may help to insert a large screwdriver or similar first and then insert the special tool. With that done, the hard bit is behind you. With the wheel against a solid object to stop it moving, hold the special tool on one end and tap the other with a mallet so the tool slowly slides around the circumference of the wheel. Each locking pin will pop out as you reach it. The locking pins can be reused. Here are some questions and answers that may help clarify the content of this page. Will my bike still be fun to ride? Will Bootiebike continue using them? Yes, unless some serious problem with them becomes apparent. Is there more rolling resistance than the pneumatics you used to use? I haven't noticed any difference (700x28). Is the ride quality as good as the pneumatics you used to use? High initial cost. Installation time consuming and fiddly. Chance you'll need to replace rims to suit width of tyres. All except those for whom speed is everything. Will they slow me down? Depends on what tyres you currently use, and how well you maintain your tyre pressures. If you don't check your tyre pressures every day, you may well be a bit faster. If you normally ride on scrupulously maintained upmarket road bike tyres, you will definitely be slower. Whatever the case, I think it's a non-issue for all but the lycra brigade. What about the handling and grip? I've seen some highly critical reviews of these tyres. How do you respond to them? I judge the tyres according to my own priorities and say it as I see it. Other reviewers have their own priorities. Does Bootiebike have any financial incentive to write a good review? There are more than a few brands of solid tyres currently available. Here are those that popped up in a quick search. Why not check out their websites and see what they have to offer?